Gnocco Fritto is a classic Italian dish from Emilia Romagna – the same region as Prosciutto di Parma – which means it has to be fantastic. This particular prosciutto recipe is on the menu at specialist restaurant Valentino in Los Angeles and is simple with minimal ingredients, yet full of flavor. 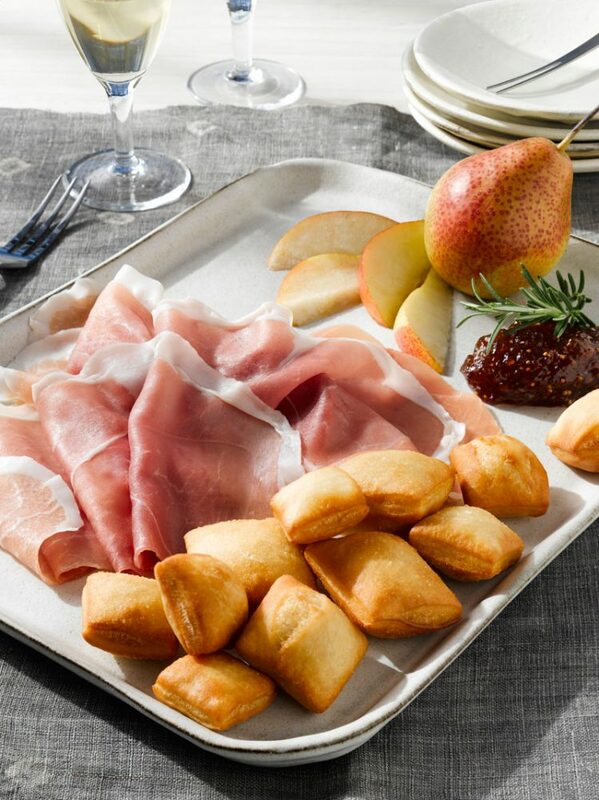 This Gnocco Fritto with Prosciutto di Parma recipe is a classic option for your customers and a great choice for holiday specials. If you’re looking for the perfect wine pairing, try an Italian Lumbrusco or take a look at our suggestions. In a large mixing bowl, combine flour, yeast, salt and sugar. Stir in milk and water. Knead 8-10 minutes, to a smooth, elastic dough; add additional water, if necessary. Place the dough in an oiled bowl; brush the top with olive oil, cover, and place in a warm place until the dough doubles in size, about two hours. Once dough doubles in size, roll out to a 1/8-inch thickness on a lightly floured surface. Using a sharp knife, cut into 1-inch squares. In a large, deep saucepan over high heat, heat vegetable oil to 350°F. Fry a few pieces of dough at a time until the pieces become little, golden brown pillows. With a slotted spoon, remove from oil and place on paper towels to drain. Repeat until all the dough is fried. Serve with Prosciutto di Parma.